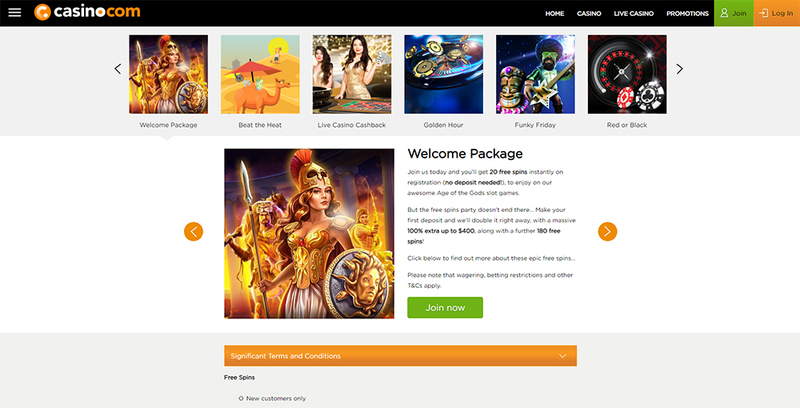 Originally a gaming advertising portal, Casino.com began supplying casino games online in 2007, quickly establishing itself as a global leading company among the casino industry. Played in more than 189 countries, Casino.com belongs to the respected Mansion group, the owner of which is ONISAC with licensing in Gibraltar. There are over 300 casino games to choose from including a live casino and mobile games, plus this online establishment offers secure money transactions, frequent bonus opportunities, responsive and professional customer support service, and advanced software 24 hours a day. Deposit & withdrawal methodsOptions include BOKU pay by phone, Swiff, credit cards, iDebit, Paysafecard, ecoPayz, Zimpler, Trustly, debit cards, Entropay, Neteller, Skrill (& Nordia by Skrill), Bitcoin, Instadebit, and bank transfers online. Casino.com offers great Welcome Bonuses for casino players worldwide, for example: register and make your first deposit and you can claim €400 +200 FS in Finland, up to 30,000 kr +300 FS in Sweden, up to $400 +200 FS in Canada, New Zealand, Norway, and South Africa. The Live Casino operates at scheduled hours and involves live streaming a professional dealer via video link to your computer. You combine advanced software with a dealer’s professional knowledge for the most realistic casino experience possible. Games include Live Roulette, Live Blackjack, and Live Baccarat. Support team can be accessed 24 hours a day with fast response times via email and telephone. The customer service is multilingual, professional and friendly, with over 20 languages supported and every query resolved in a timely manner. Languages include English, French, German, Swedish, Finnish, Norwegian and Spanish. Casino.com provides you with a range of leading payment options for your deposits and withdrawals, with options to suit players from around the globe. Options include BOKU pay by phone, Swift, credit cards, iDebit, Paysafecard, ecoPayz, Zimpler, Trustly, debit cards, Entropay, Neteller, Skrill (& Nordia by Skrill), Bitcoin, Instadebit, and bank transfers online. The variety of trusted and established payment options mean that you enjoy secure deposits that are also fast and efficient every transaction. Operated and owned by ONISAC, Casino.com is proud to be part of the Mansion group, with its license issued in Gibraltar. The online casino has eCogra approval and ensures complete data security via the industry’s best P128-bit SSL (Secure Socket Layer) encryption. With more than 189 countries accessing Casino.com gaming products and services, this truly global online casino is a brand you can trust. Register in the casino to enjoy 300+ state-of-the-art casino games, fast money transactions, professional support when required, a number of languages and wide range of currencies, a secure mobile casino, generous bonuses and frequent new promotions. The gaming library includes online slots, standard table games, video slots, video poker, arcade games, 3D games, games with live dealers and many others. For the biggest wins, look for progressive jackpot casino games available across all game types. Register receive no deposit bonus - 20 free spins at the game: Age of the Gods. Wager: x20 Max winnings - $100. 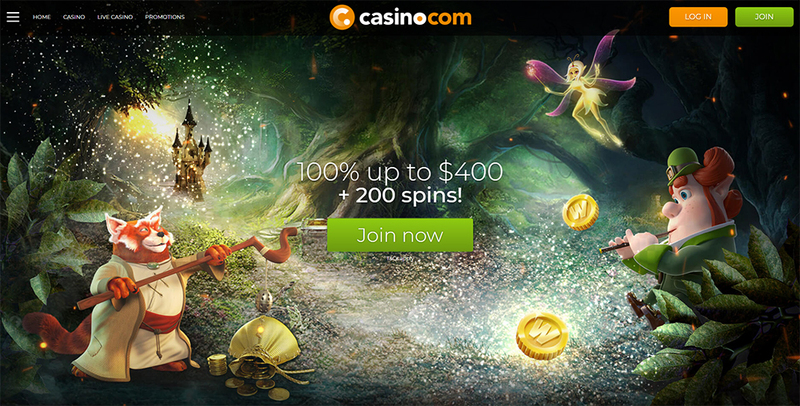 For new players, Casino.com is glad to offer First Deposit bonus 100% up to €400 + 180 free spins in Age of the Gods slot (credited as 20 spins a day). Min deposit €20.